About a year before its scheduled official launch as the newest member of Washington State Ferries’ fleet, the superstructure of the 144-car ferry Suquamish will move by barge from Jesse Co.’s fabrication facility near the Port of Tacoma to Vigor’s Harbor Island Shipyard in Seattle. The superstructure is expected to leave Tacoma on Wednesday afternoon, travel up Puget Sound and arrive at Harbor Island in Seattle on Thursday morning. 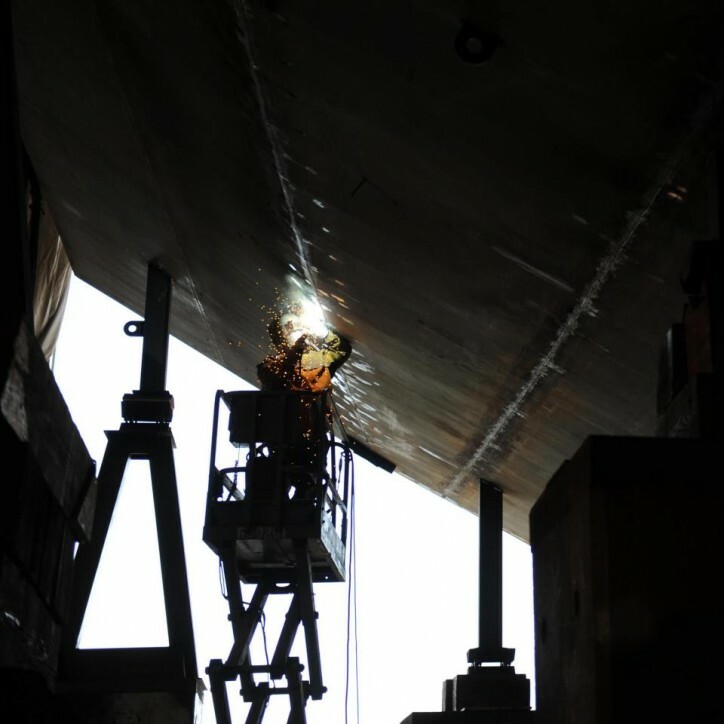 The movement of the superstructure, or top half, of the 362-foot vessel is not only a major milestone but also illustrative of the wide-ranging jobs and economic impact of building ferries in this state. Jesse Co. is one of more than a dozen subcontractors working with Vigor on the Suquamish, the state’s fourth new Olympia Class ferry. Each 144-car ferry built in Washington generates up to 560 direct jobs at shipyards and subcontractors, and a total of 1,300 direct, indirect and induced jobs in the Puget Sound region. The movement of the Suquamish superstructure to Seattle is scheduled to begin Wednesday morning when it is loaded onto a barge at Jesse Co.’s facility in Tacoma. At the same time Vigor is scheduled to move the Suquamish hull, or bottom half, which is being built on Harbor Island, into its massive drydock. The superstructure is scheduled to arrive at Vigor early Thursday and will be joined to the hull on Friday. Completing the construction of the vessel with all necessary engineering, propulsion, electrical, safety and other components prior to sea trials will take approximately 11 more months. The Suquamish is scheduled for delivery to Washington State Ferries in July of 2018. The Suquamish will be the fourth and final currently authorized addition of new Olympic Class 144-car ferries to the WSF fleet, following the Tokitae in 2014, Samish in 2015 and Chimacum earlier this year. Construction cost of the Olympic Class 144-car ferries has been within one percent of the projected budget on each vessel. “All of us at Vigor are honored to do this work for Washington State Ferries and for the people who will use these ferries for decades to come,” continued Foti. Maritime is a $30 billion industry for the State of Washington and provides more than 148,000 jobs, according to a study by the Economic Development Council and Workforce Development Council of Seattle and King County. Washington State ferries are built to serve for 60 years with appropriate maintenance. That’s the longest lifespan of virtually any vessel fleet. In comparison the U.S. Navy typically retires vessels after 35 years, the Coast Guard after 30 years, and BC Ferries at 40 years. Washington’s ferry system is the largest in the country because of the geography that needs to be traversed and because so many people, communities and businesses depend on it as an essential marine highway. Ridership eclipsed 24 million in 2016, the highest total in 13 years, and is expected to continue to grow. The ferry system is also one of the top tourist attractions in the state. Tourism is the state’s fourth largest industry, generating $1.8 billion in state and local tax revenue annually and supporting 170,500 jobs. 9:45 a.m. Wednesday: Superstructure goes onto a barge at Jesse Co. in Tacoma; hull goes onto drydock in Vigor’s Harbor Island Shipyard. Expect 1-3 hours to roll superstructure onto the barge in Tacoma, and 4 hours to lash it down. 8 a.m. Friday: Superstructure rolled onto hull at Vigor. Expected timeframe for marrying superstructure and hull – four hours. Jesse Co. is at 1840 Marine View Dr. in Tacoma, and Vigor’s Harbor Island Shipyard is at 1801 16th Ave SW in Seattle. *Times above are approximate and subject to change as they depend on operations and other conditions.